The exhibition's title Mach Dich hübsch! is derived from the special artist’s book, published on the occasion of the exhibition. The book, a scrapbook in the style of Genzken’s well-known publication I Love New York, Crazy City, is full of playful collages in which she reflects on big-city life, media culture, sexual identity, and her own biography. 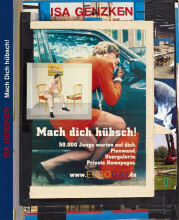 The original publication is on view in the exhibition. A facsimile is available in the shop, priced at € 39,80 (ISBN 978-3-86335-869-3).